If you have a YouTube channel, you can generate more business leads from YouTube, without Youtube ads or other advertising. YouTube for business marketing? Yep. I’m going to show you 3 techniques to drive traffic to your site or landing pages, where you can engage more deeply. 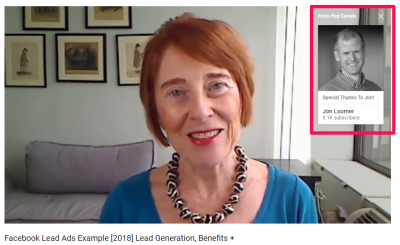 The post that I’m summarizing today is 3 Ways to Generate Leads Using YouTube, by Rikke Thomsen. It’s from the Social Media Examiner blog. 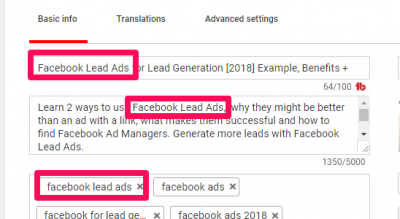 I’m going to use examples from my video about Facebook Lead Ads to demonstrate the 3 techniques to generate leads from YouTube. See the video above for an overview and Rikki’s blog post above for step-by-step instructions. This is what YouTube Card links and cards displayed look like. See my video or Rikki’s post for how to create. 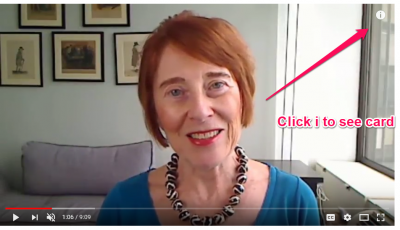 To learn how to create end screens that encourage people to watch more of your videos, visit your website, take a poll, donate or visit a partner channel, see my video or Rikki’s post. This is how the end screens appear on a real video. Use keyword phrases that get search traffic in your video title, description and tags. This brings more traffic and more qualified traffic to your video, which the cards and end screens can then drive to your website and potentially generate YouTube leads. Be sure you list your website, phone, and social profiles in your About page and in default copy you put at the end of every video description, using channel defaults. If you are trying to grow your YouTube Channel, build your following there and get your videos found in search, you might NOT want to send viewers to your website. YouTube ranks videos by how long people say on the platform, so it hurts your video rankings to send viewers off. Tim at @VideoCreators discusses the DISadvantages of sending traffic off YouTube to your website. He does it occasionally to build his email list. Also, on some videos designed for his fans, he alerts them to his products and courses. But otherwise, he wants people to stay ON YouTube to improve video watch time and audience retention, the metrics YouTube uses to determine how frequently to display your videos. FYI, everyone. If you want more business leads from YouTube, I suggest you take an action now, while these features are fresh in your mind. How about logging in, picking your most popular video, and adding a card or an end screen with a link to your YouTube-verified website (found on your About page)? The best way to get more YouTube leads is to give people another place in your video or description to click to your website, AND give them a reason to do so. That’s how the pros use YouTube for business. That’s YouTube without ads, in a nutshell. More social media lead gen tips? 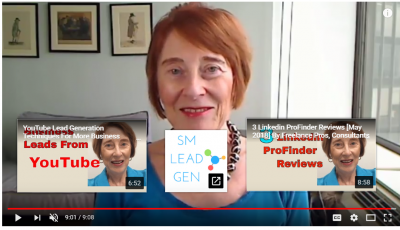 Check my YouTube Channel on Social Media Lead Generation.